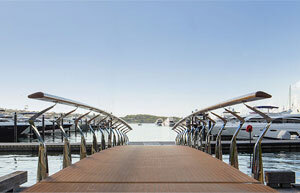 The Boutique Boat Company’s purpose built marina at Prospect Quay in Fremantle is without equal. positioned in the lively Fremantle Fishing Boat Harbour, near the entrance of the beautiful Swan River and on the edge of the Indian Ocean. Only thirty minutes from Perth city it features a wide range of designer vessels and is the home of luxury boating in Western Australia. Our expert onsite team include Princess yacht specialists and technical staff with vast experience in luxury boats of from 30 metre super yachts to 30 foot high speed cruisers. 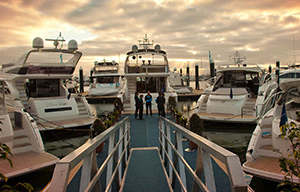 Our redeveloped marina also offers small motor yacht to super yacht berths for long and short-term leases. Please enquire for further information. The Prospect Quay marina offers an unrivalled opportunity in Perth to step aboard luxury vessels and experience beautifully designed and crafted vessels first hand. Armed with years of experience around luxury yachts, our dedicated staff are experts in luxury boating and the lifestyle that goes with it; the expectations of our clients and their demands for quality and service. Our team can discuss every detail of the our yachts for sale, inside and out; the internal finishes, technical particulars, sea-keeping performance and an understanding of the liveability and on-board experience. Whether you’re buying or browsing, thinking about a super yacht, a luxury flybridge vessel, a powerful sports yacht, or a high speed cruiser – we work with you during the entire purchase journey. Our expertise in the luxury lifestyle on the water can aid you in the selection and personalisation of the perfect vessel for your lifestyle needs. We service a wide range of clients across Australia and internationally. 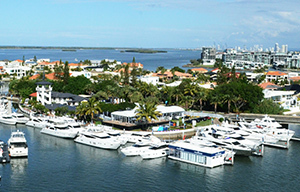 We have the ability to ship to offshore locations and provide berthing opportunities at our network of marinas from the Great Barrier Reef, to The Gold Coast, Sydney and across to Western Australia, available for long or short term lease. With proximity to the river and ocean , our Prospect Quay Marina is the perfect place for buyers to berth their vessels so that owners can enjoy all Western Australia has to offer.